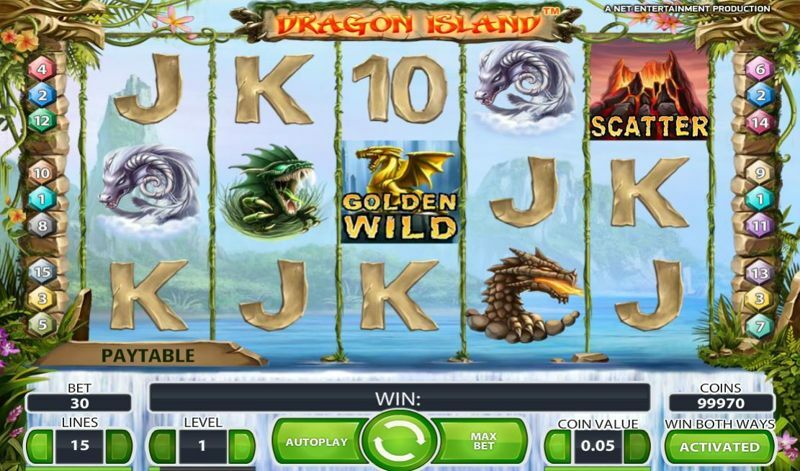 Dragon Island is a fantasy-themed slot, fresh from the Net Entertainment lab. Net Entertainment are one of the world’s most reputable and trusted providers of casino games, and slot titles, and to date, their game range has entertained players from all around the world, with their titles featured in hundreds of online casinos around the world. 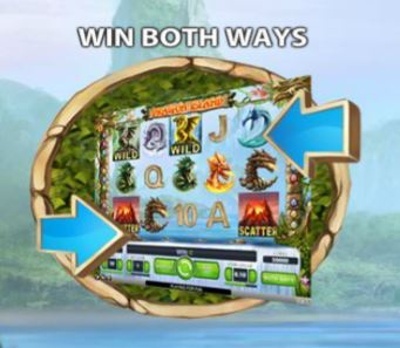 Dragon Island was a new approach for Net Entertainment, because it was the first Net Entertainment Video Slot to use the “Any-Ways-Pays” structure. While this only activates during if the player chooses it to, it set a precedent for Net Entertainment, which meant it was later included in popular slots such as Starburst. Dragon Island itself uses 5 reels and 15 pay lines, and players can spin from as little as 15p a time, to as much as £75 per spin. If you choose to play the “Any-Ways-Pays” structure (meaning you get paid from left-to-right, and right-to-left), there are 30 pay lines, which means the minimum stake becomes 30p, with a cap of £150. Dragon Island can be played on all types of device, including desktop computers, laptops, and mobile devices; this is thanks to Net Entertainment’s HTML5 technology, which allows most mobile devices to easily load and run the game. While Dragon Island doesn’t offer the most in the way of bonus features, it does present a unique playing experience, with Net Entertainment’s “Any-Ways-Wins” structure, so we can forgive them for not expanding on the bonus. While not “technically” a feature, it’s important to list the pay line structure, as it affects how much you stake, and how your gameplay will pan out. You can either choose to play the game in “regular mode” – which is using 15 pay lines – or you can double the stake to enjoy an extra 15 pay lines, which pays you on wins starting from the right-hand-side of the screen, going left. This is similar to Starburst, with the “paying for extras” theme seen in another popular Net Entertainment title, Koi Princess. 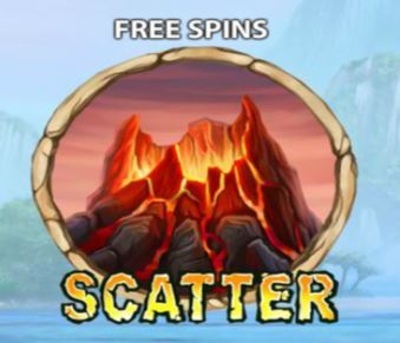 Land three or more of the scatter symbols (the Volcanos), and you’ll be awarded 10 free spins, with a 3X stake prize. Landing 4 scatter symbols gives you 20 free-spins, with a 10X stake prize, and if you manage to land all 5 scatter symbols, you’ll be given a whopping 50 free-spins, with a 100X prize. During the free-spins, before each spin begins, one reel will randomly have a dragon appear on it, and this reel is then fully-wild for that specific spin. Ideally, you want this on reels two or three, as this is said to be the best position in order to make 4-of-a-kind and 5-of-a-kind pay line, but remember; if you’ve activated the “Any-Ways-Pays” bonus, reels three and four will also be as fruitful. You can re-trigger the free-spins by landing more scatter symbols during the bonus, and this can continue up to a total of 500 spins.